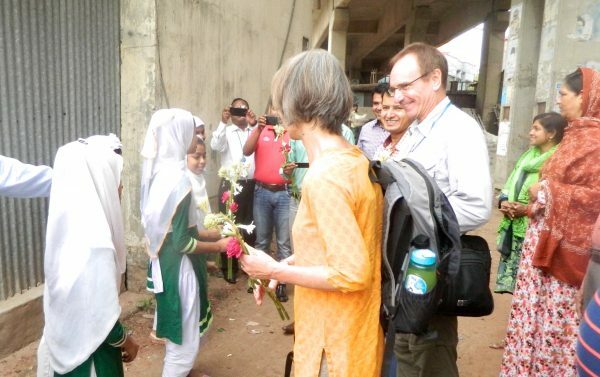 A six-member DFID (Department of International Development) team led by Jane Edmondson, Head of DFID Bangladesh visited Buriganga River on 7 November 2016 along with David Gray, First Secretary of British Embassy in Bangladesh. They also participated in a community meeting of the boatmen at Kholamura Ghat, Kamrangirchar. The team arrived at the starting point of the river near Bosila at around 10am. Sharif Jamil, Burignaga Riverkeeper welcomed them by the bank of the river behind the Bosila Old Government Primary School. The students and teachers along with the community people received them to the river with flowers. Sharif Jamil briefed the team about the river; its problems and prospects. He explained them in details about the encroachment and pollution to the Buriganga including the long efforts of Buriganga Riverkeeper to protect this very important river. He also discussed about the activities of Waterkeepers Bangladesh. The team started towards Kholamora Ghat at around 10.30am from Bosila by the patrol boat of Buriganga Riverkeeper. A community meeting held at Kholamora Ghat at around 11am. 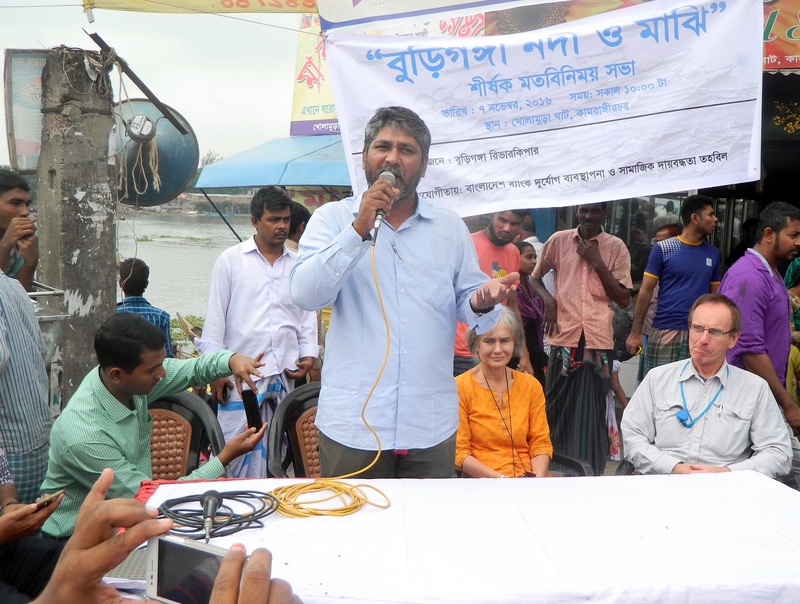 The community meeting was organized by the Buriganga Riverkeeper with the local fishermen and boatmen who are dependent on the Buriganga water. The team members, especially DFID head were keen to know about the condition of the local people. 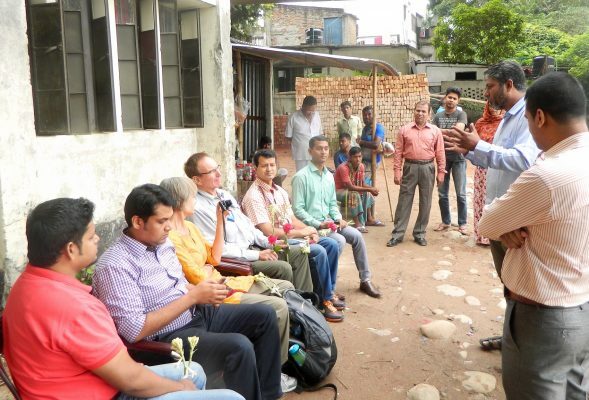 Jane Edmondson, Head of DFID Bangladesh, wanted to know about the health impact of the pollution to the river and the future of the workers in Hajaribag tannery. Billal a former tannery worker, who recently changed his profession to be a boatman, replied that he would need to expense half of his income for his health care while he was working in the tanneries. So, he and many others like him are not interested to work in the Tanney Industries at their new place in Savar. Community member Abdul Kader (40) accused the tannery most for the pollution to the Buriganga. Abdul Barek (50) said that waste disposal by the waste collectors on the bank of river is the major cause of water pollution at Kholamora area. Sharif Jamil complemented that there should be an alternative way of waste disposal. Md. Yusuf (40), a community member said that the water quality is very poor and rivers must be protected for the betterment of country. Ripon (40) shared his experience regarding Buriganga River saying that he smelt malodor while the day before that day he went to catch fish. 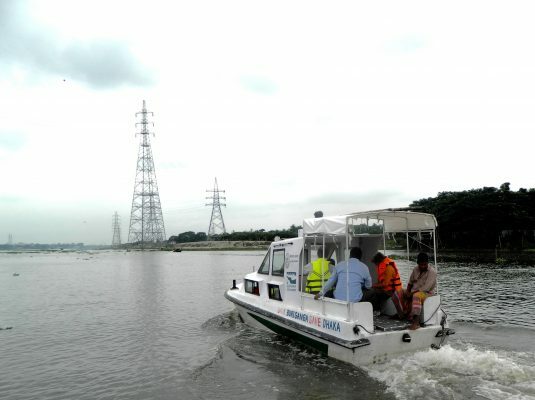 After attending the community meeting, the team returned to the boats and started for Sadarghat landing station from where they departurted to DFID office in the noon.